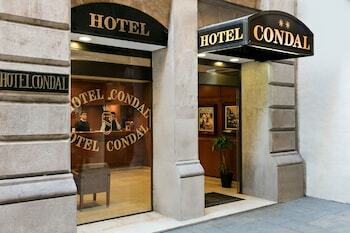 A stay at Hotel Condal places you in the heart of Barcelona, steps from Las Ramblas and Gran Teatre del Liceu. Featured amenities include a 24-hour front desk and an elevator (lift). With a stay at Hostal Ribagorza in Barcelona (El Born), you'll be within a 5-minute walk of Palau de la Musica Catalana and Arc de Triomf. The front desk is staffed during limited hours. With a stay at Aparthotel Novo Resort in Chiclana de la Frontera, you'll be steps from La Barrosa Beach and a 4-minute drive from Golfo de Cádiz. Free self parking is available onsite. When you stay at Hotel Rural Casa Lugo in Agulo, you'll be 14 minutes by car from Santa Catalina Beach. Featured amenities include a computer station, multilingual staff, and luggage storage.